[i] …… we find increases in holdings of home durables (notably metal roofs, ownership of which increased by 23 percentage points over a control group mean of 16 percent), and productive assets such as livestock, whose value increases by USD 85 over a control group mean of USD 167. These investments translate into higher revenues from agriculture, animal husbandry, and non-agricultural enterprises; monthly revenue from these sources increases by USD 17 relative to a control group mean of USD 49. Note, however, that this revenue increase is partially offset by an increase in flow expenses for agriculture, animal husbandry, and business (USD 13 relative to a control group mean of USD 24). [ii] We find that indeed monthly transfer recipients are significantly less likely to invest in durables such as metal roofs than lump-sum transfer recipients, suggesting that households may be both credit- and savings-constrained. The fact that program participation required signing up for mobile money accounts, which are a low-cost savings technology (people could have chosen to accumulate their transfer – and even add other money – on their M-Pesa account), suggests that the savings constraint at work is more social or behavioral than purely due to lack of access to a savings technology. [iii] …. contrary to previous literature and our expectation, we find no significant differences between transfers to men and transfers to women in expenditure decisions or any other outcomes. … we find significant reductions in cortisol levels in several treatment arms: specifically, large transfers, transfers to women, and lump-sum transfers lead to significantly lower cortisol levels than small transfers, transfers to men, and monthly transfers. Some of these effects occur in the absence of differences in traditional outcome variables. Together, these results support a causal effect of poverty (alleviation) on (reductions in) stress levels. More broadly, they suggest that psychological well-being and cortisol can complement traditional welfare measures, and in some cases may in fact respond to interventions with greater sensitivity than these traditional measures. So what are some of the policy implications? Direct cash transfers are not the panacea to underdevelopment. But these findings and others out there (see summary here) are evidence that we should seriously consider Martin Ravallion’s idea of raising the consumption floor of the poorest of the poor in developing countries through direct policy intervention (e.g. through cash transfers). Making direct cash transfers work for development will be predicated on taking the interventions out of the humanitarian/aid sphere, and integrating them into the national political economies of developing countries. In my view, the need for a higher consumption floor will soon become politically salient due to rapid urbanization rates in many developing countries. Obviously, aid money alone will not be able to fully finance such a policy. More efficient public finance management in developing countries will be one way to fill the gap. Putting aside the overhyped storied budgetary leakages due to corruption, many developing countries still do not meet their annual budgeted expenditure goals due to lack of absorptive capacity, i.e. money simply never gets spent at the end of the fiscal year and is returned to the treasury. For instance, according to an internal Ugandan government report, between 2004-2010 an average of 3.4% of budgetary allocations to central government ministries, departments, and agencies returned to the treasury (this was net of corruption and other leakages). Note that the figure is most likely higher if you factor in local government expenditures. And as Figure 2 above shows, late disbursement is the norm, which makes budgeting within government agencies a nightmare. 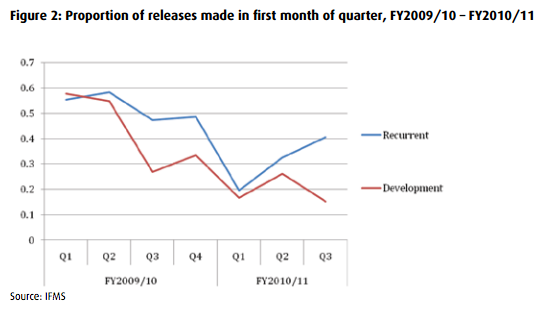 In addition, over the same period (2004-10), the proportion of the budget that was simply not released (as opposed to released and not absorbed) was a staggering 9.92%! This is money that can go directly to citizens’ pockets. And we have the technology, thanks to M-Pesa, to effect the policy. Governments shouldn’t be allowed to handle more money than they have capacity to spend. Plus making legislative appropriation conditional on agency capacity could be a way to incentivize capacity building more than a million workshops and study tours could ever do. Lastly, the idea of a consumption floor for the urban poor might not appeal to some higher income tax payers. But smart politicians should be able to remind these voters that there is only so much physical security that one can get from high fences topped with electrified razor wire.